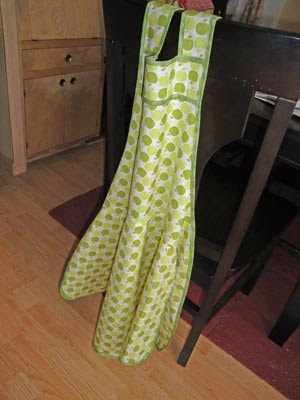 For my sister's birthday, I made her the Mango Tango apron from the book A is for Apron. Firstly, the pattern in the book needs to be enlarged 400%. Rather than try to figure out how to accurately enlarge the image on a copy machine and then tile the resulting sheets of paper, I went to Kinko's. The lady who was at the counter was extremely helpful. She suggested that I first photo copy the page at regular size and then run that copy through the scanner for the large format copying machine. Otherwise I would have had to rip apart the book to get the page to feed through the scanner. A word to the wise, the large copies are not cheap. I copied three patterns in the book and ended up paying more for the copies than the book itself. Secondly, the neck straps are a bit short so I would lengthen the straps by at least one inch on each side or try to make them adjustable. Thirdly, the center rectangle panel is completely missing from the pattern. I had to read the instructions a few time to make sure that I just wasn't paying attention. I simply cut a rectangle 3" high and the width of the top pattern piece. 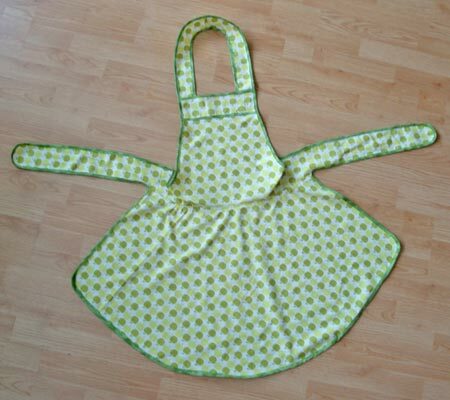 If making this apron for a short-waisted person like me then I wouldn't add the rectangle. But if the person has a long or regular length torso, then adding the rectangle would help make the apron fit better. Fourthly, I would lengthen the ties if the intended wearer is an American size 8 or larger. Which means that the fabric would have to be 1.5 yards instead of the recommended 1 yard. With the leftover fabric, I had just enough to make one matching oven mitt. The picture would be better with actual cupcakes instead of empty liners. And because I don't like wrapping things in paper anymore given how much fabric I have, I made a tote to hold all the items. Eventually everyone in my family will have enough totes to change them daily. 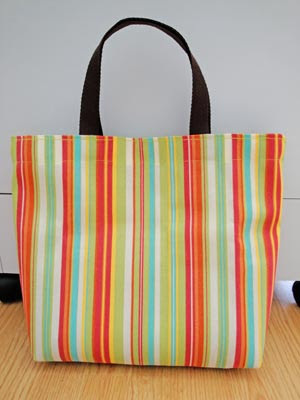 The bag has an interior pocket and a magnetic snap. I recently saw A is for Apron at Barnes and Noble and put it on my wish list for when I have time to advance in my sewing. 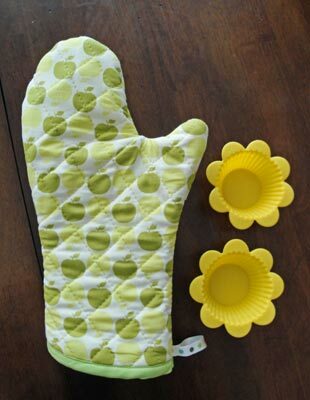 I LOVE the matching cooking mitt!